Scroll to the bottom for a complete list of articles in The Immigrants’ Civil War series. 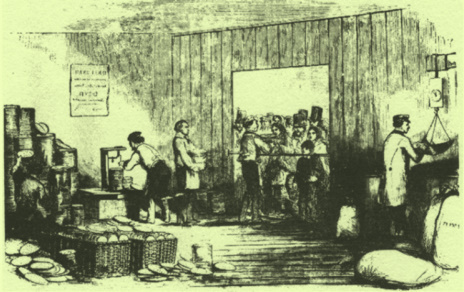 The sale of matzo in New York City during the 1860s. From Frank Leslie’s Journal. Historian Bertram Korn writes that the successful resolution of the “Chaplain Controversy,” as it has come to be called, was the “first major victory [for American Jewry] of a specifically Jewish nature.” Col. Friedman, Rabbi Fischel, and Abraham Lincoln had teamed up to end legal discrimination against non-Christian chaplains in the United States Army. 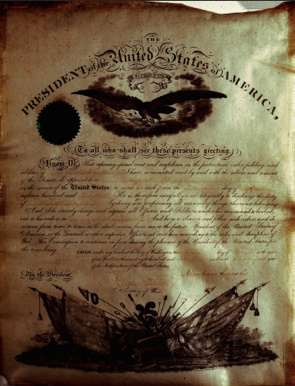 Jacob Frankel’s chaplaincy certificate, March 2, 1864. Frankel was the first official Jewish chaplain in American history, and was commissioned in September 1862. For Fischel’s letters written during the controversy, click here. 2. “Dragoons” were cavalry who were expected to dismount during a battle and fight on foot using carbines (short rifles that were easy to carry by a mounted man). 20. Fischel letter, January 4, 1862. A group of reformed rabbis published a letter informing Congress that Fischel did not speak for them. 1. Immigrant America on the Eve of the Civil War – Take a swing around the United States and see where immigrants were coming from and where they were living in 1861. 2. 1848: The Year that Created Immigrant America – Revolutions in Europe, famine and oppression in Ireland, and the end of the Mexican War made 1848 a key year in American immigration history. 3. Carl Schurz: From German Radical to American Abolitionist– A teenaged revolutionary of 1848, Carl Schurz brought his passion for equality with him to America. 4. Immigrant Leader Carl Schurz Tells Lincoln to Stand Firm Against Slavery. 10. Immigrant Day Laborers Help Build the First Fort to Protect Washington-The Fighting 69th use their construction skills. 12. Immigrants Rush to Join the Union Army-Why?– The reasons immigrants gave for enlisting early in the war. 13. Why the Germans Fought for the Union? 14. Why Did the Irish Fight When They Were So Despised? Should Lincoln Have Lost His Citizenship? The First Casualties of the War Were Irish-Was that a Coincidence? Germans Re-enact the Civil War-But Why Are They Dressed in Gray?